Well, many of you have asked me how the sausage making went. In the words of my dear husband, "It was an unqualified success." We made boudin rouge (blood sausage, solely for my father-in-law's sake) and boudin blanc, my absolute favorite Louisiana staple. I was born in Louisiana, and most of my extended family still lives there. We moved away when I was 2, but I was still raised on the Cajun/Creole cuisine: red beans and rice, dirty rice, gumbo, boudin, jambalaya, etoufee, shrimp creole, cracklin, po'boys... YUM. I used Emeril's recipe for boudin and doubled it. I was SO PLEASED!! 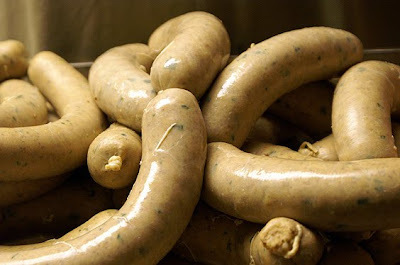 It's EXACTLY Louisiana boudin! Actually, it was better, becuse we made it :). The blood sausage still gives me indigestion just thinking about it. I tried to have as little to do with it as possible. So my father-in-law and husband made it. I love my father-in-law. He made sausage in his cap and suspenders. But seriously, it was gory. It was bloody. It was disgusting. Okay, think I'm being a baby? I'll show you a picture. And my kitchen looked like a scene from CSI. But I'm more than happy with my personal stash of real Louisiana boudin! EWWWW! More and more I am being converted to a vegetarian...I still like the taste of meat, but just thinking where it comes from makes me gag. 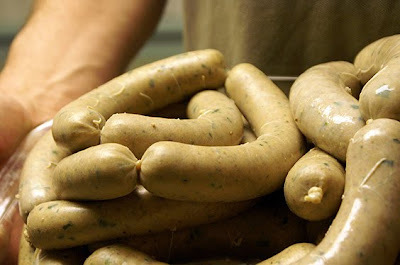 I definitely agree with you that the Boudin Blanc look much more appealing / edible. You have a better stomach than most to make it through that whole process! A British priest explained to me what blood sausage was once. Ugh. Apparently in Britain they also call it "black sausage." I do not understand its appeal. No "Black Sausage" in Germany--it is unromanically called "blutwurst" (Blood Sausage). I think this post is going to have my husband hunting for a grinder with a sausage attachment! He lived in LA in his teens ("Nawlins" and the surrounding parishes), and still has a constant hankering for the food. His sister was a chef at a 4-star B&B there, and can cook like anything! That is so creepy!!! 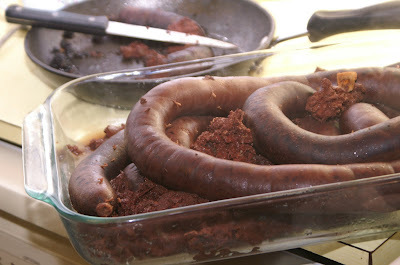 LOL I tried blood sausage once (a Portuguese recipe) I was not found of it. Very grainy. 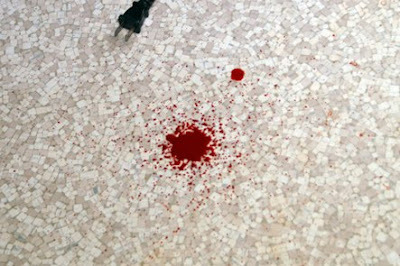 Love the splotch of blood on the floor... lol... that would be enough to make me not want to eat it!! Rachel! Don't forsake meat! I remember watching Rescue 911 when I was a kid (remember that show from the early 90's?) and seeing a bloody knee made me never want to touch my own knee again because I knew that right under the skin was grossness. But that's ridiculous, right? So is forsaking the wonderful world of bacon, steak, fried chicken, beef jerky, pork chops and pepperoni because of a little squeamishness :-D.
Emily -- no, I definitely don't get the appeal. I guess it used to be a cheap sausage for poor people to make (because the blood is usually thrown away anyway) but I'd have to be pretty stinkin' hungry to see it as a luxury. Nadja -- YAY for N'awlins!! It's pretty much the best food in the country :). We got a Waring Pro meat grinder for our wedding (I think they run about $90) and we use it ALL the time. When pork shoulders go on sale for 99cents a pound we make bratwurst and Italian sausage, and it makes great ground chicken, too. Amy Caroline -- I still have not brought myself to taste the blood sausage. I tried to be brave, but I just couldn't get past the fact that it's... BLOOD.